New Year is coming and it means that it’s time to bring something fresh and new to your room décor.It’s nice to surround yourself with some good-looking pieces of furniture, new textile, pictures, and statuettes. The great think about updating your room décor is that you don’t have to spend tons of money to buy it. Your room is the space where you can let all your creative freedom out. By doing a simple room DIY project using materials that you already have at home, you’ll be able to transform your room and give it a new, fresh look. Moreover, doing a DIY project is agreat way to spendtime with your kids and engage their creative vision to make these DIYs more personalized. Interested? 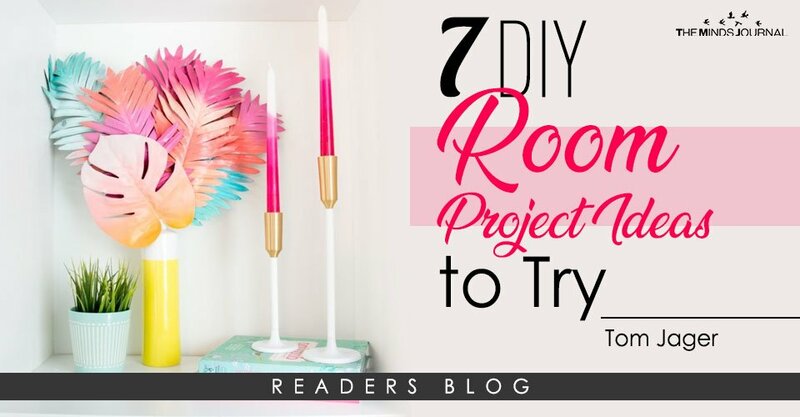 Let’s take a look at 7best DIY room project ideas you can try to greet the New Year with the new room décor. Do you have walls in your room that are painted with plain color? Then this DIY project is a perfect match for you. Washi tape is a simple material that can help you transform your room and make it more festive-looking. The ruler may be optional if you’re not looking for completely even and perfect-looking geometric forms.Simply create a pattern you want to follow by doing some light pencil strokes on a wall, then take your washi tape and follow the patternby adjusting it to the wall. You can take multi-colored washi tape,it’s entirely up to you and your vision. Washi tape allows you to follow any pattern you like, it’s simple to adjust and to remove if you make a mistake. It’s a great DIY project to involve your family and enjoy the result together. This is a great DIY project that is perfect for the wintery time of year. It will make your room look more elegant, romantic and cozy. It’s very easy to make and you’llbe able to enjoy the results of this DIY project all year around. The project is very easy: you take the teacups you don’t use. While the wax is melting on your stove,place wicks in your cups and secure their tips on top of the cups with a clothes peg. When the wax has melted, add a bit of food coloring and essential oil, mix everything together and fill thecups. Let everything cool down and sit, remove clothes pegs. Your DIYteacup candles are ready. This DIY project is also a great giftto anyone. When I was working at collegepaper, I gave these candles as a present to some of mycolleagues and they loved it. This project is not time-consuming and is very fun to make. I was inspired to create this DIY project when I saw similar photoclipboards on ETSY. They don’t take much time tomake, don’t require too many materials and look very pretty on awall. You can use them to décor any room at home and change photosin them any time you get tired from the previous ones.